"Great moments in climate prediction: ‘World will warm faster than predicted in next five years, study warns’"
That now failed 2009 headline is from Duncan Clark in the Guardian. The authors of this alleged "skeptic silencing" paper were Judith Lean [of "Judithgate" fame] and David Rind of NASA GISS, who very confidently predicted global temps would warm 0.15C plus or minus 0.03C [i.e. warm from 0.12C-0.18C] during the five year period 2009 to 2014. Further, the paper predicts there will be a "pause" in warming due to low solar activity for the subsequent 5 years from 2014-2019 with a temperature change of only 0.03C +/- 0.01. 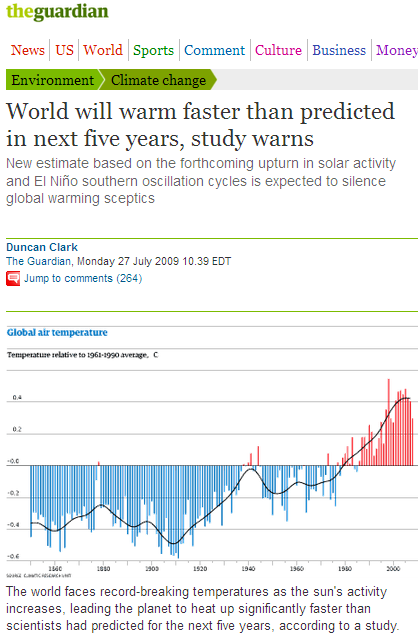 Ironically, this paper which was claimed by the Guardian rag in 2009 to "silence global warming skeptics" was not only wrong about the predicted anthropogenic warming, but also [possibly correctly] predicts that low solar activity will lead to a "pause" in warming from 2014-2019. 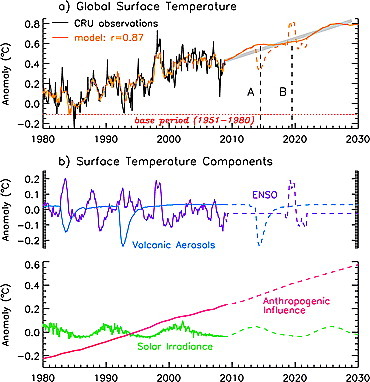 Graph from Lean & Rind paper with predicted warming from the NASA GISS climate model shown in top graph to 2014 [labeled as "A"] and to 2019 [labeled as "B"]. The globe actually cooled 2009-2014. Lean & Rind predicted a "pause" in warming will occur 2014-2019 due to low solar activity.